The term t’ai chi ch’uan translates as “supreme ultimate fist”, “boundless fist”, “great extremes boxing”, or simply “the ultimate”. Note that chi in this instance is the Wade-Giles transliteration of the Pinyin jí, and is distinct from qì (or chi 氣), meaning “life energy”. The concept of the Taiji (太極,”supreme ultimate”), in contrast with Wuji (無極, “without ultimate”), appears in both Taoist and Confucian Chinese philosophy, where it represents the fusion or mother of Yin and Yang into a single Ultimate, represented by the Taijitu symbol. 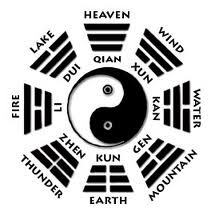 T’ai chi theory and practice evolved in agreement with many Chinese philosophical principles, including those of Taoism and Confucianism. T’ai chi training involves five elements, nei gung, tui shou (response drills), sanshou (self defence techniques), weapons, and solo hand routines, known as forms (套路 taolu). While t’ai chi ch’uan is typified by some for its slow movements, many t’ai chi styles (including the three most popular –Yang, Wu, and Chen) – have secondary forms of a faster pace. Some traditional schools of t’ai chi teach partner exercises known as “pushing hands“, and martial applications of the forms’ postures. In China, t’ai chi ch’uan is categorized under the Wudang grouping of Chinese martial arts—that is, the arts applied with internal power (an even broader term encompassing all internal martial arts is Neijia) Although the Wudang name falsely suggests these arts originated at the so-called Wudang Mountain, it is simply used to distinguish the skills, theories and applications of the “internal arts” from those of the Shaolin grouping, the “hard” or “external” martial art styles. Since the first widespread promotion of t’ai chi’s health benefits by Yang Shaohou, Yang Chengfu, Wu Chien-ch’uan, and Sun Lutang in the early 20th century, it has developed a worldwide following among people with little or no interest in martial training, for its benefit to health and health maintenance. Medical studies of t’ai chi support its effectiveness as an alternative exercise and a form of martial arts therapy. It is purported that focusing the mind solely on the movements of the form helps to bring about a state of mental calm and clarity. Besides general health benefits and stress management attributed to t’ai chi training, aspects of traditional Chinese medicine are taught to advanced t’ai chi students in some traditional schools. Health: An unhealthy or otherwise uncomfortable person may find it difficult to meditate to a state of calmness or to use t’ai chi as a martial art. t’ai chi’s health training, therefore, concentrates on relieving the physical effects of stress on the body and mind. For those focused on t’ai chi’s martial application, good physical fitness is an important step towards effective self-defense. Meditation: The focus and calmness cultivated by the meditative aspect of t’ai chi is seen as necessary in maintaining optimum health (in the sense of relieving stress and maintaining homeostasis) and in application of the form as a soft style martial art. Martial art: The ability to use t’ai chi as a form of self-defense in combat is the test of a student’s understanding of the art. T’ai chi ch’uan is the study of appropriate change in response to outside forces, the study of yielding and “sticking” to an incoming attack rather than attempting to meet it with opposing force. 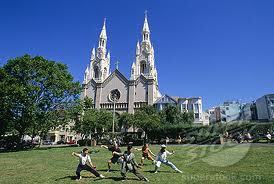 The use of t’ai chi as a martial art is quite challenging and requires a great deal of training.